Denver is known as the Mile High city and as far as Al Gore is concerned, the high altitude, the thin air of the city may have been a contributing factor to President Obama’s poor debate performance agains Mitt Romney on Wednesday night. Talk about scraping the bottom of the barrel. Yes, it can take time for some people to adjust to the altitude in Denver, but the president has been there many times before for speeches and has never shown any ill effects, until now apparently. Then again when it comes to climate, we all know how accurate Gore has been in the past. The fact is that Obama came into the debate totally unprepared and his performance was so stunningly bad, that even the liberal media couldn’t provide cover for their favorite son. It wasn’t the altitude, but the attitude that sank Obama in Denver on Wednesday night. Last night’s presidential debate between Mitt Romney and Barack Obama set a new record topping the previous record set during the Democratic National Convention thanks in part to Big Bird. According to the Twitter Government team, Romney’s mention of Big Bird and cutting subsidies to PBS generated 17,000 tweets per second while tweets about PBS clocked in at 10,000 tweets per second. 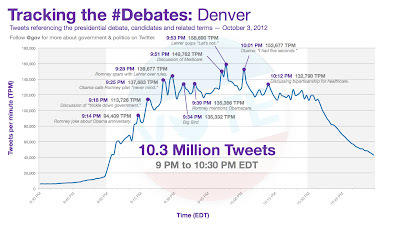 According to Twitter, the debates generated 10.3 million tweets, topping the 9.5 million tweets issues during the Democratic National Convention in early September. I knew something was up when I saw my twitter feed appearing on my computer at lightning speed, making it hard to keep up with those that I follow. The next debate will be between Paul Ryan and Joe Biden and should attract a significant amount of attention, but it will be hard pressed to top last night’s figures.